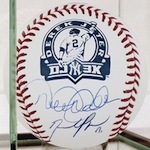 Further adding to the hoopla surrounding Derek Jeter's 3,000th hit, Steiner Sports has announced that David Price has signed to be a part of the company's "DJ3K" line of memorabilia. Price, a pitcher with the Tampa Bay Rays, gave up the home run marking Jeter's milestone. Price has agreed to sign photos and baseballs commemorating the event and some will even include the inscription "I Gave Up DJ's 3K, 7-9-11." Balls and pictures are available for sale that will be signed just by Price or by both Jeter and Price. They can be viewed at the Steiner Sports website. Baseballs are also available from Christian Lopez bearing the inscription, "I caught DJ3K." Dual-signed balls from Lopez and Jeter are expected soon. The Lopez ball can be seen here.